Thiruvananthapuram or Trivandrum, lying on the southwest coast of India, is the capital to the state of Kerala. The city extends from latitude 8°29' N to longitude 76°59' E. The place is well connected to most of the other major cities of India through rail, road, and air network. Because of its nearness to the sea, the climate of Thiruvananthapuram is tropical. This also gives Thiruvananthapuram a very pleasant weather round the year. The average maximum temperature can go up to 36.2°C in summer months and to a minimum of 18.0°C in the winters. Monsoon comes to Thiruvananthapuram in the month of May and remains there until November. The city, according to the legends, boasts of being associated with King Solomon whose ships landed at a port called Ophir. Traders have been coming to these parts as far back as 190 ad for spices, sandalwood, and ivory. Thiruvananthapuram shot into prominence in the 18th century when the capital was shifted here form Padmanabhapuram, a little down south. The erstwhile kings of the then Travancore State, taking on the title of Padmanabhadas (servant of Lord), had dedicated themselves completely to the service of the Lord residing in the temple here. By the terms of this dedication, the deity owns the kingdom while the king is the mere executor of the trust. After independence, the city was designated as the capital of Kerala. Thiruvananthapuram, earlier known as Trivandrum, is the capital city of Kerala. The name literally splits into "Tiru", "Anantha" "puram" meaning "the town of Lord ANANTHA". This is really true since the temple is at the heart of the town and for generations, the kings have called themselves "Padmanabha-Dasa" or the "servants of LORD Ananthapadmanabha", and ruled the state as the representatives of LORD Anantha-Padmanabha. This temple, built by Raja Marthanda Varma in 1733 A.D. is a fine specimen of South Indian architecture. It is in honors of Lord Vishnu and He reclines here on Anantha the serpent. This magnificent temple tower rises in seven stories against the reflecting pool in front. This temple, built by Raja Marthanda Varma in 1733 A.D. is a fine specimen of South Indian architecture. It is in honor of Lord Vishnu and He reclines here on Anantha the serpent. This magnificent temple tower rises in seven stories against the reflecting pool in front. The town has a history of supporting fine art and culture. The Kings of Tiruvancore (Thirunals as they are known) have not only promoted art but have themselves been accomplished artistes. The most famous of them is Swathi Tirunal who is a well known composer in both Karnataka and Hindustani styles of music, and Raja Ravi Varma the internationally acclaimed painter, well known for inventing paints using natural materials. 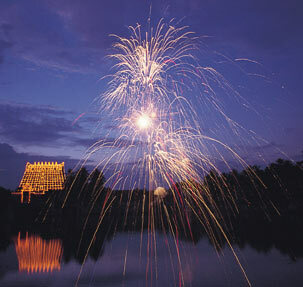 The town bustles with activity during Navaratri, when music festivals are held in the Sri Padmanabha Swamy Temple. Unique in its style, the temple combines the Chola and Chera styles and is large enough to conduct processions within the temple. There is a separate quadrangle for dancers, where even the pillars are tuned and reverberate to different notes! Anantha-Padmanabha in reclined posture is a large statue, which needs to be viewed from three separate doors. During the beginning of this century, the state had a statesman Diwan called Sir.C.P.Ramaswamy Iyer, who made women's education compulsory and free. He also allocated 15% of the state budget to education, laying the foundation for 100% literacy, which Kerala achieved quite a few years ago. We can see vivid proof of the religious tolerance of this state - a mosque, a temple, and a church are within yards of each other at Palayam Junction. About 96% of the people of the District speak Malayalam as their mothertongue. Only 2.5% of the people speak Tamil as their mothertongue. As in the case of all other languages, there is some difference between the colloquial language and the written dialect in Malayalam also. Though there is difference in the dialects spoken by the various sections and classes of the society, the fundamental unity of the Malayalam language is not affected in any way. The dialects spoken by the more primitive of the hill tribes differ considerably from the ubiquitous Malayalam, but they hardly deserve to be regarded as separate languages. Rice is the staple food of the people. The Nairs, Ezhavas and other such castes are not generally vegetarians, though some individual members may stick to being strict vegetarians. There is no great difference in the dietary habits of the Christians and Muslims. The routine diet in a family consists of breakfast, lunch, tiffin and supper. Kanji or Rice gruel with some vegetable curry and pickles formed the main breakfast until very recently in almost all families, but it has now been replaced by tea, coffee or other beverages taken along with dishes like Dosai , Idly, Poori, Chappathi and Uppuma. The lunch is always substantial, the most important items of the menu being cooked rice or Choru, special curries and butter milk. Parboiled rice is used here instead of Kaccha or raw is In all culinary preparations coconut oil is freely used instead of gingelly or mustard oil used in other parts of India. The tiffin in the afternoon consists of a cup of tea or coffee and some sweet or delicacy. The supper which is taken after sunset consists either of Kanji or similar items as for lunch. When there was acute scarcity of rice in the wake of the Second World war, Wheat was used as a substitute for rice. Preparations of wheat such as Poori , Chappathi and Uppuma are becoming popular. Owing to the poor cattle wealth of the District, milk is used only by richer sections of the community. Pickles of mango, cherunaranga (lime fruit), nellikka (the fruit of phyllanthus emblica), etc., are popular. The condiments generally used are turmeric, pepper, ginger, cardamom, cloves , spices , chilli , mustard , onion, garlic etc. Hydrogenated oils like Vanaspathi are seldom used. There are a number of tourist attractions in Thiruvananthapuram, India. A must on every tourist itinerary for Thiruvananthapuram, the Padmanabhaswami temple with its gopuram (tower) soaring majestically upwards, is believed to be one of the 108 shrines sacred to the Vaishnavites in India. 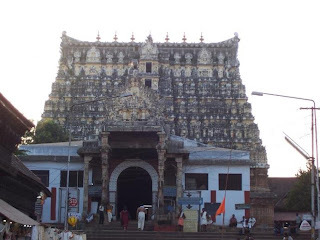 Besides this magnificent temple, Thiruvananthapuram offers a great deal more. There is the Observatory to start with, established over a hundred years ago in Thiruvananthapuram in India. 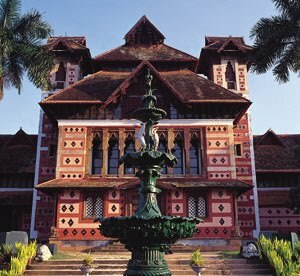 Several kings have also built their palaces in and around the Thiruvananthapuram, India, each more impressive than the other. Despite a few attempts at modernity, Thiruvananthapuram retains its discreet, old-world charm. 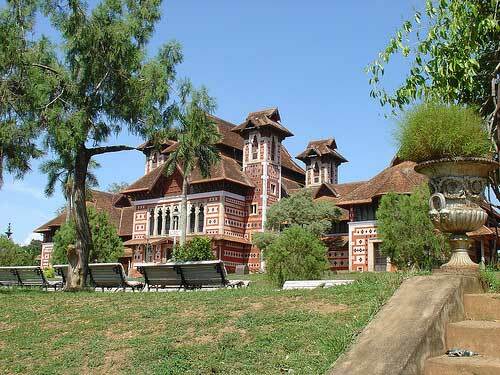 In Thiruvananthapuram one can visit the Museum with its profusion of gables and turrets. A repository of fine works of art, the chief attraction here is the 250-year-old temple car made for Lord Vishnu, artistically designed and ornamented. Besides this, objects carved out of wood, models of temple, antique jewelry, etc., make the museum worth a visit. 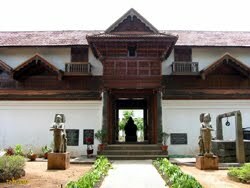 Lying within the museum compound of Thiruvananthapuram, Sri Chitra Art Gallery proves to be an ideal place for art lovers. The piece de resistance is the large section devoted to the paintings of Raja Ravi Varma, an Indian painter of distinction in the history of the country's modern art. Besides him, the Indian section also contains works of Rabindranath Tagore, Jamimi Roy, K. K. Hebar, miniatures from the Rajput and Mughal schools of painting and the famous Tanjore paintings encrusted with semi-precious stones. The gallery's collection also includes paintings from Indonesia, China, and Japan. Then, of course, a trip to Thiruvananthapuram in India is incomplete without a boat-ride on its enchanting backwaters. These waterways of Thiruvananthapuram in India teem with life. One can be seduced by the panorama of beautiful landscapes, beaches and waterways, coconut palms and, of course, beautiful, friendly people of Thiruvananthapuram in India. 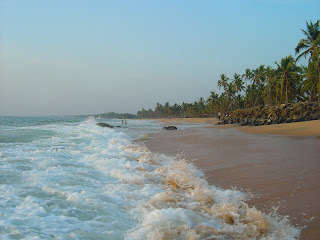 The small historical town is situated 10km; north-west of Attingal is hemmed between Lakshdweep Sea and Anjengo Kayal. The English East India Company established a factory in 1673 and also built a fort with the permission of Queen of Attingal in 1695. The beach ruins of the fort and flagstaff, tombs of Dutch and British are some historic places to visit. The salubrious hill station of Ponmudi is at a distance of 61 kms from Thiruvananthapuram. 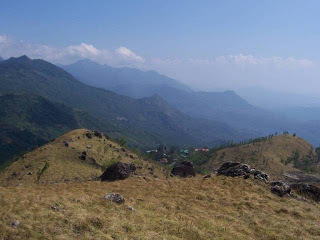 Ponmudi is located 915 metres above sea level. An idyllic hill resort with narrow, winding pathways and a cool, green, wooded environs, Ponmudi is located 915 metres above sea level. Along with a variety of beautiful mountain flowers, exotic butterflies and small rivulets the natural scenery, salubrious climate and the scope of hiking in high trails make the visit an exhilarating experience. There is a charming deer park which is only 3kms from Ponmudi. One will find oneself compulsively pausing every now and then to drink in deep the spectacular sweep of the hill ranges, tea-estates and the mist-covered valleys, peppered with little toy-like stone cottages painted a pretty violet, pink, or white with pointed and peaked roofs. This is a prominent peak in the Sahyadri range and is the second highest peak in Kerala, at a height of 1890 metres above sea level. 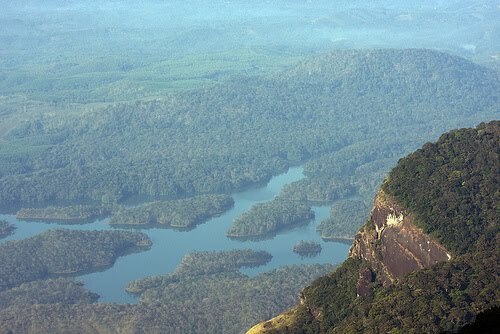 Teeming with wildlife, the forests of Agasthyakoodam abound in rare medicinal herbs and plants and brilliantly hued orchids. A bird watcher's paradise, this legendary mountain is accessible by foot from Kotoor, near Neyyar Dam, as also from Bonacaud. .The mountain is revered by both Buddhists and Hindus, as it is believed to be the abode of the Bodhisattva Avalokitesvara as well as of the sage Agastya, a disciple of Shiva. Located on a hill opposite to the Kanakakunnu Palace, another attraction worth a visit is the Government Observatory which offers a lovely view of the city from its roof terrace. 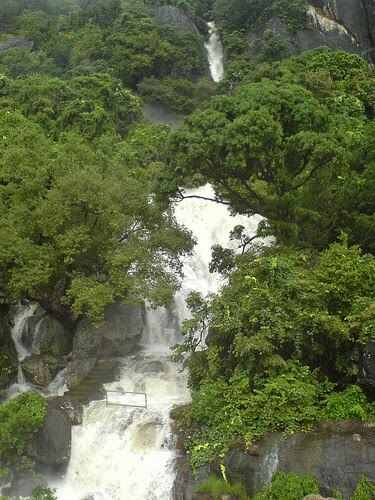 Beautiful and serene, the Aruvi is blessed with a weather that is as perfect as the land itself where 4 ft. cascade, is one of the most verdant and unspoiled spots in Kerala. 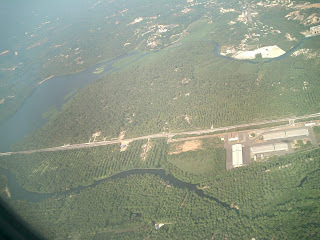 It is 60 kms from Trivandrum. Tourists are mainly attracted to this place because of the natural scenery. The temple of sage Agasthiar near the waterfalls draws a large number of devotees on the full moon day in the months of April and May. Trekking can be done in this place. 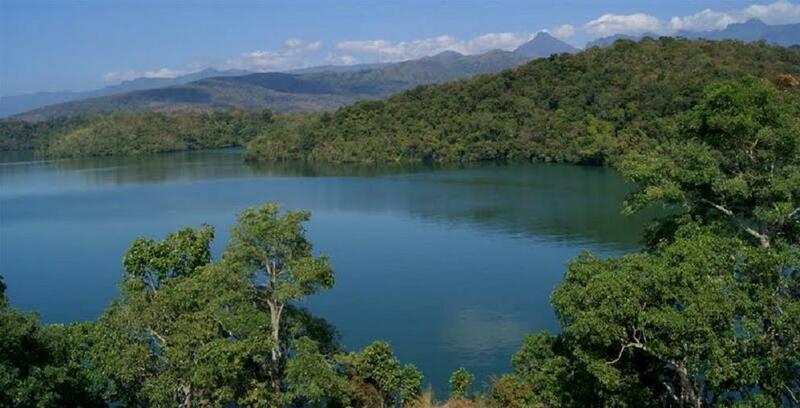 Neyyar dam, lying against the southern low hills of the Western Ghats, 32 kms away from the city is a popular picnic spot with a lake and a picturesque dam site. Neyyar dam is situated 90-18000 metre above sea-level. It is an extension of Kallikad Tiger Reserve and Mudanthura Wild life Sanctuary of Tamilnadu. 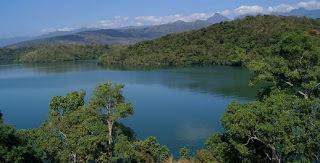 Neyyar dam affords a panoramic view of the mountains and the lake. The lion safari is a star attraction. The reservoir also offers boating facilities in addition to a crocodile farm. The project offers facilities for boating and mountaineering. A miniature wild life sanctuary, a lake garden and a swimming pool are the major attractions. Peppara wildlife sanctuary is a 'gene pool' sanctuary, with a rich variety of flora and fauna over a rugged terrain with running rivulets, rolling hillocks and green meadows. The sub tropical and tropical evergreen forests are populated with a variety of wildlife. This sanctuary with its rich fauna and birds is emerging as a big attraction to wildlife enthusiasts. The sanctuary is home to Elephants, Sambhar, Lion-tailed Macaques, Leopards, and assorted birds. Gaur, Barking Deer, Wild Boar, Tiger and the Nilgiri Langur are also among the main inhabitants of the park. A boat ride on the site is a fulfilling experience. Although Peppara is theoretically open all year, the main season is from January until May. Kovalam is just 16 kms away from Trivandrum. This unique internationally renowned wonderful beach will get pride of place amongst the loveliest beaches in the world has been a favourite haunt of tourists since the 1930s. The palm-fringed bays in secluded coconut groves, promise a relaxed stay. The boundless blue waters of the Arabian Sea and miles of white sands washed away by the surf at the feet of the stalwart palms and the rocky promontories, makes this beach paradise. This marvelous beach is a tourist's dream come true. The beach is located 8 kms from Thiruvananthapuram city and is adjacent to the Thiruvananthapuram International Airport, is a favourite spot of sunset watchers. The Sankhumugham Beach is just not a mere beach but a hot bed activities and boasts of some exciting nearby sites. 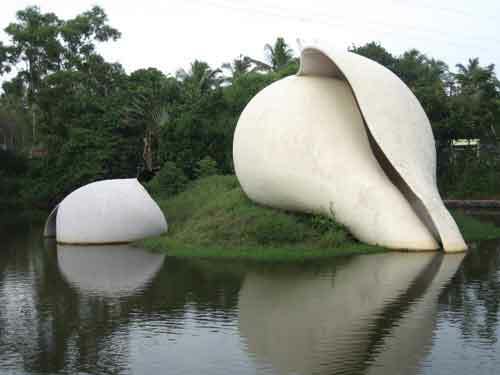 A 35meter long sculpture of a matsya kanyaka is the main attraction of Shankumugham. Another one is a starfish shaped restaurant. Chacha Nehru Traffic Training Park provides opportunity for children to learn the traffic rules. The beach is a fishermen village ensures an interesting sight of fishermen having their daily catch. Varkala is a sea side resort, as well as an important hindu centre of pilgrimage. Situated at 42 km away from Thiruvanathapuram, is the best spot along Kerala coast for watching sunset. High cliffs with rich mineral springs rise majestically from the coastline. 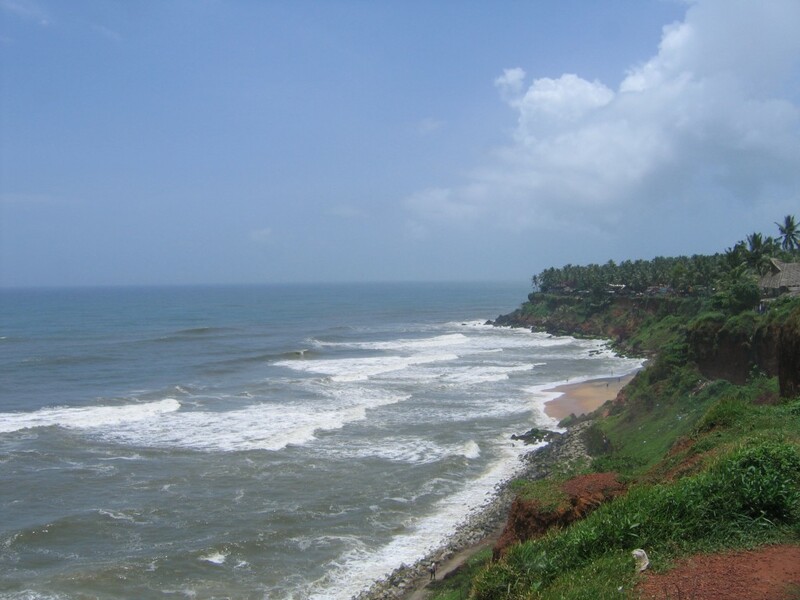 The Varkala sands have become an ideal spot for confluence of cultures exotic and alien. The 2000 year old Janardana Swamy Temple and the Nature Centre are the two main attractions here. High cliffs border the excellent beach. It's a beautiful beach that has a more than 2000 years old shrine of Lord Vishnu. This beach is rich in mineral water springs that are known for their medicinal value. A dip in the holy waters of this beach is believed to purge the body and the soul of all the sins hence the name 'Papanashini' for this shore. At the break of dawn following the new moon in the Malayalam month of 'Karkidakam', thousands offer 'Vavu Bali', a ritual believed to help the souls of ancestors rest in peace. 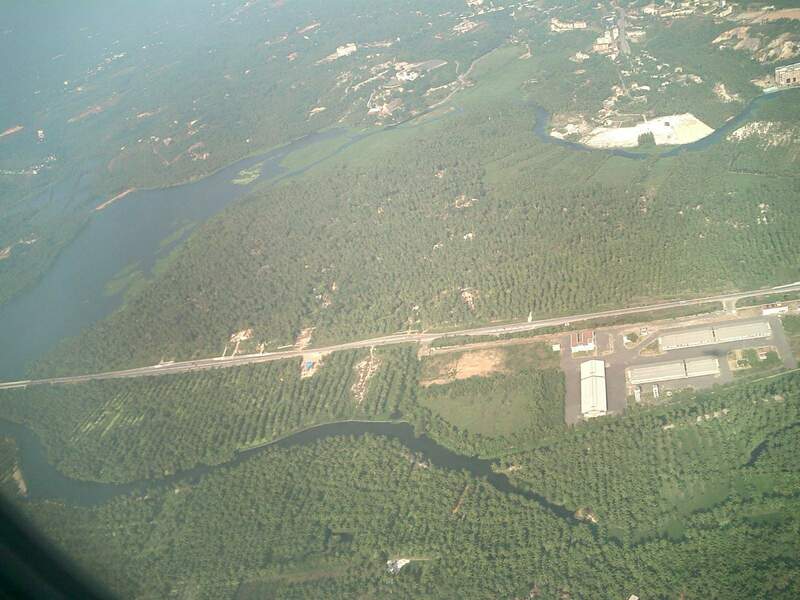 Akkulam Lake is situated 3 kms away from Ulloor junction, in Thiruvananthapuram city and is only 10 kms away from the Central Railway Station. The spot is developed on the banks of Aakkulam Kayal (lake), which is an extension of the Veli Kayal (lake). There is a tranquil picnic spot on the banks of the Akkulam Lake. Akkulam is a place of great scenic beauty with a picturesque lake. There is a boat club with over dozens of boats, available for joy riders. The children's park here is one of the biggest in Kerala. Lazing on the cool banks or boating on the placid waters is good ways to spend a holiday. There is also a children's park. Akkulam is one of the first picnic spots in the suburbs of Thiruvananthapuram City. The calm and serene atmosphere and its unique natural beauty is fascinating for the tourist. The village consists of the Boat Club, Swimming Pool, Children's Park, an Anthurium Project and a Snack Bar. Located 8 km from Thiruvananthapuram city, the Veli Tourist Village is bordered by the Veli lagoon and the Arabian sea. The lagoon here is separated from the sea by a narrow sand bar. The Veli Tourist Village on the outskirts of Trivandrum is a delightful waterfront park which has become extremely popular with Keralites. The nearby Veli Tourist Village will provide luxurious comfort to the tourists. The long stretch of clean white sand of the beach is perfect for an idle stroll along the sea. One can also relax in the beach, watching the fishermen doing their daily chores. During the festivals, the Thiruvananthapuram's Sankhumugham Beach witnesses the maximum crowd that gathers for the idol immersions. It is a nice place for tourists with young children to spend an afternoon. There are lots for the kids to do, and they will meet many of their young Keralite counterparts, all of whom will be eager to make new friends and try out their English. Aanchunthenghu Fort located at 36 kms away from Thiruvananthapuram. The historic remains of the fort built by the British East India Company in the 17th century and an adjoining cemetery are the noteworthy relics of this first major British trading station on the Malabar Coast. 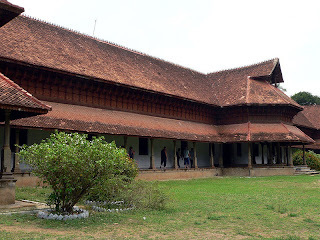 The Padmanabhapuram Palace, about 60 km from Tiruvananthapuram, was once the home of the Royal family of Travancore. It is one of the biggest palaces in India with intricate carvings and beautiful woodwork. Travancore, which was a princely state for over 400 years, included a large part of present-day Kerala and the western part of Tamil Nadu. Though the palace is now in the State of Tamil Nadu, it was once the traditional home of the royal family of Travancore, so it is maintained by the Government of Kerala. 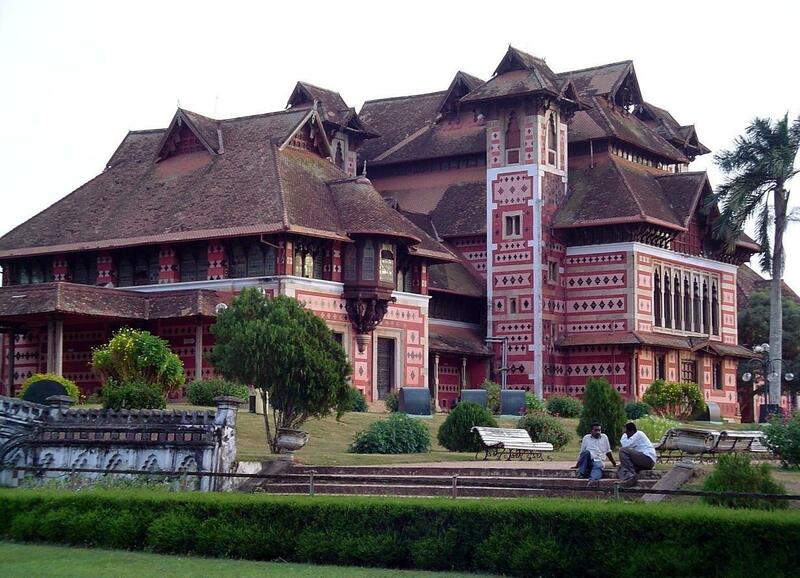 The palace is one of the best examples of the traditional wooden architecture of Kerala. The Palace is famous for its 17th and 18th century murals, carved mahogany ceiling, coloured mica windows, secret underground passages, inner courtyards, museum, four poster medicinal bed, Belgian mirror, pictures of Lord Krishna, granite dance halls and special black shiny floors which are made from a unique combination of egg white, jaggery, lime, burnt coconut, charcoal and river sand. Kuthiramalika (Puthenmalika) palace is located near Padmanabhaswamy temple. Maharaja Swathi Thirunal Balarama Varma - the King of Travancore, built this magnificent palace. He was a great poet, musician, social reformer and statesman. 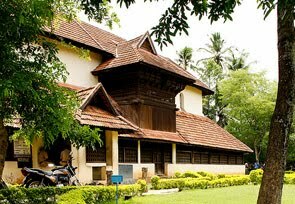 The palace, built in the traditional Travancore style of architecture depicts excellent craftsmanship and possesses exquisite wood carvings. The palace museum has on display, enchanting paintings and other priceless collections of the royal family. The palace remains open from 8:30 am - 12:30 pm & 3:30 pm - 5:30 pm and is closed on Mondays. 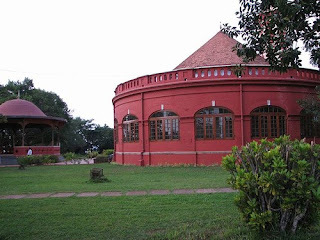 Kanakakunnu Palace is the summer-house of Travancore Royal Family. The palace and its grounds are today the venue for many cultural meets and programmes. Koyikkal Palace is located 18 km from Trivandrum on the way to the Ponmudi hill station and the Kuttalam waterfalls, this ancient place that dates back to the 15th century, is famous in the history of Kerala as the official residence of Perakom Thavazhi (the maternal lineage), especially of Umayamma Rani of the Venad royal family. Here you can see a double storied traditional Nalukettu building with slanting gabled roofs, an inner courtyard and two museums of folklore and numismatics set up by the Department of Archaeology. The 'Gajendra Moksham' Mural which is one of the largest mural paintings in Kerala is seen on the ground floor of the Palace. A museum with antique sculptures, paintings and bronzes is housed inside the building. The Palace is situated 47kms from Alleppey. 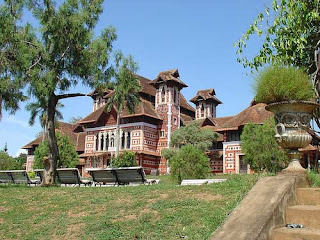 The Napier Museum was built in 19th century. It was opened to the public by a committee, in which The maharaja of Travancore Sree. Utram Thirunal was the director and the resident of Travancore General kallan was the Chariman . At the starting time it has a few collection of metals from all over the world, some books of Genral Kallan. A new building was built in 1880 by the supervision of an architect named Mr.Chishome. The building was inaugurated by Mr. Napier, the Governor of Madras and so the museum was called as Napier Museum. Now it has a vast collection of archaeological and historic artifacts, plastic casts, bronze idols, ancient ornaments, a temple chariot and ivory carvings. The small historical town 10km. north-west of Attingal is hemmed between Lakshdweep Sea and Anjengo Kayal. The English East India Company established a factory in 1673 and also built a fort with the permission of Queen of Attingal in 1695. The beach ruins of the fort and flagstaff, tombs of Dutch and British are some places of interest. A large collection of Toys from various parts of the world is available here. There is a good number of stamps and masks on display in this museum. A mini aquarium and the first issue of children's literature in Malayalam are also exhibited here. Chacha Nehru Museum is set up in the model of Shankar's International Doll Museum in New Delhi. 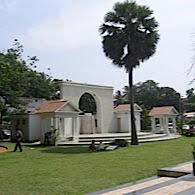 The museum is situated about 1 km north of Thiruvananthapuram Central Bus Station. Next to the museum, this is in a smaller, traditional building established in 1935 has a century old world famous paintings of Raja Ravi Varma, the pioneering Indian genies in the art of oil painting. It houses the collections of the Travancore ruling family, and included an interesting assortment of turn-of-the-century Bengali school paintings, Rajasthani and Mughal miniatures. Tanjore paintings and a selection of works by a Russian emigrant, Svetosku Roerich and by Kerala's favorite artist son, Raja Ravi Varma is major attraction. The latter's works include a number of portraits of maharajahs and their families, British residents and distinguished individuals, and by studying their faces one gets a glimpse of a part of Kerala's history. The architecture has a combination of Kerala tradition. Bronze images, ivory carvings, temple chariots and historical ornaments present an excellent collection. One can spend few hours easily viewing all the displays. This place is open for visitors from 10:00 am - 5:00 pm and remains closed on Mondays & Wednesday forenoons. Renovated in 1733 AD by the then ruler of Travancore, Raja Marthanda Varma, this holy shrine attracts thousands of Hindu devotees. Located inside the east fort, this fascinating temple is the most important landmark of Thiruvananthapuram. 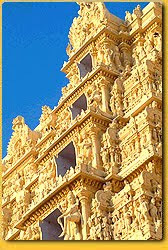 The temple portrays both Kerala and the Dravidian styles of architecture. It is a grand seven storied structure adorned by innumerable stone carvings, ancient inscriptions and colourful murals. There are around 324 pillars in the temple corridor. The main Deity in this temple is Lord Padmanabha, who reclines on Anantha, the thousand-headed serpent. Two nearby places worth visiting while in Thiruvananthapuram, India are Veli and Shankhumuggam; the former has been converted into a superb tourist village while the latter boasts of lovely temples and a huge statue of a mermaid presently being worked upon by a famous sculptor. An absolute must is Kovalam that lies barely 18 km away Thiruvananthapuram. The beach is considered one of the finest in the world and provides ingredients for an ideal holiday excursion from Thiruvananthapuram. Besides swimming, there are opportunities for surfing and water skiing-even an exhilarating catamaran ride into the sea. 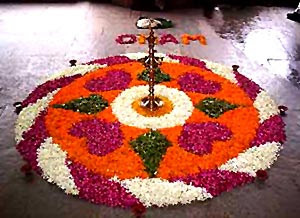 Onam is the main festival of Thiruvananthapuram, which is celebrated in the month of August or September. This is the harvest festival of Thiruvananthapuram and signifies association of the people with agriculture. Christmas is the other festival of this part of the country and Thiruvananthapuram wears a colourful look during this time of the year. Classical Music Festival is celebrated from January 27 to February 3 every year and is a great time to enjoy for the lovers of pure classical music forms such as Carnatic and Hindustani music in Thiruvananthapuram, India. Thiruvananthapuram is the capital of Kerala and one of the finest tourist destinations in the God's Own Country. Thiruvananthapuram is bounded by the Arabian Sea on the west and Tamil Nadu on the east. Thiruvananthapuram has a number of popular tourist destinations. Koavalam is the most beautiful beach in Thiruvananthapuram. The other tourist attractions in Thiruvananthapuram include Shanghumugham Beach, Padmanabhaswami Temple, Kanakakunnu Palace and Koyikal Palace. Thiruvananthapuram has a number of hotels that provide all the modern facilities to tourists visiting Thiruvananthapuram. Thiruvananthapuram has an excellent tourist infrastructure and accommodation facilities. Hotels in Thiruvananthapuram range from high-end hotels to budget and economy hotels. Thiruvananthapuram also has a number of government-approved hotels. Hotels in Thiruvananthapuram offer value for money. Tourism of Kerala provides complete information on tours for Thiruvanathapuram India. Thiruvananthapuram is a wonderful tourist destination in Kerala that offers tourists palm fringed beaches and wonderful monuments. 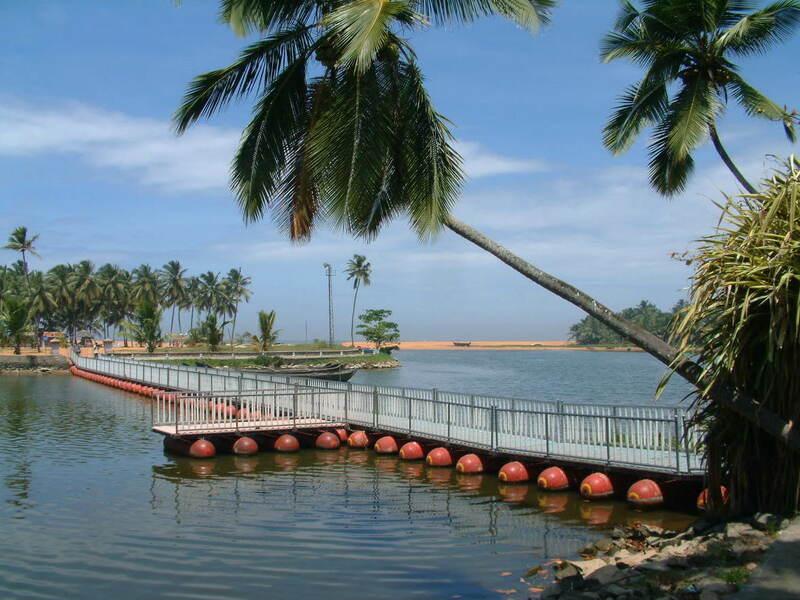 Thiruvananthapuram has a number of tourist attractions that you can tour. Some of the important tourist attractions in Thiruvananthapuram include Padmanabhaswami Temple, Kanakakunnu Palace Shanghumugham Beach, Kovalam Beach, Botanical Gardens, Zoo Koyikal Palace and Ponmudi. 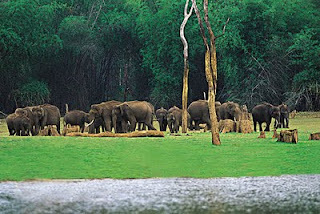 Tourism of Kerala offers complete information on Kerala travel and tourism. Tourism of Kerala also offers various tour packages to Thiruvananthapuram India and to book tour packages for Kerala, please fill up the form given below. Tourism of Kerala will get back to you.